Remote CCTV monitoring services provide you with peace of mind. 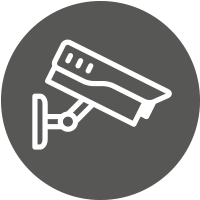 And with Farsight monitoring your CCTV systems you can feel reassured that you have a 24/7 security solution in place that’s managed by highly skilled personnel. There are up to 5.9 million CCTV cameras in the UK – make yours one of the effective ones with remote monitoring from Farsight. Contact us today to find out more about how we can protect your site. Your Internet connection routes the CCTV images from cameras at your site over the web to our servers at the Farsight Observatory. The connection between your security system and the Farsight Observatory can be live at all times or automatically switched on at the end of the working day. Our software monitors activity. As soon as an alarm is activated on your site, the incident is routed to the screen of one of our security professionals. Our professional operators will then monitor activity manually. We can pan and zoom cameras, switch cameras for a better view, and rerun recent footage. And we communicate with intruders via loudspeaker. But because we’re describing live events, the emergency services will react regardless. If it were a static alarm signal, without any visual verification, the incident may be deprioritised. Watch our video on how remote CCTV monitoring works. Everything we do is fully transparent. You can log on to our system, using YourSight, at any time to see what’s going on at your premises and at our remote monitoring station. By combining the records on YourSight with the reports we issue you can start to see hidden patterns in security incidents. Are night-shift staff propping open fire doors? Is there a particular time of night favoured by intruders? And what is their preferred route into your site? We go beyond the industry standards here at Farsight and continually work towards achieving and maintaining accreditation. Find out more about the standards we set. Get in touch with us today to find out how we could provide your site with the highest quality remote CCTV monitoring. Get in touch with us today to find out how Farsight Security Services could improve your security and business efficiency. Phone us 0845 371 0101 or send us an email.